over the years i have had many people ask me what my favorite pattern is. i have a really, really, really hard time answering. this stays true to this day. all of my patterns mean a little something different to me. however, if you were to ask what pattern i felt was the most dear to me...i might have an answer for you. with all of that said...i want to show you yet another way you can use your lazy susan pattern. in this blog post, we will learn how to add this adorable bow to the classic neckline of the lazy susan. i cannot imagine it getting any sweeter than that. oh how i love this variation! ps - check out that front tooth. it is so loose that it is hanging sideways. the hair on the back of my neck prickles just thinking about it. haha. first things first - hopefully you already have the pattern. if not - you can find it here in my etsy shop. now, make the decision of whether you want to make a dress or a top (the main difference is the bodice length, the top is more empire-waisted and the dress has almost a drop waist). i honestly think this bow will look precious on either! the only additional item you will need for this variation is another 1/4 yard of fabric for your bow neck. you probably wont even use all of that, but add the leftovers to the scrap bin! just a tid-bit: this is just a tutorial to be used in conjunction with the actual pattern. i will not go into details here on construction or how to make the dress itself. this tutorial only includes instructions on how to add the bow to the neck. okay - let's get started! grab your outer (not lining) bodice pieces and sew along the shoulder seams as shown by the dotted line. take over to the ironing board and press out those seams. take the outer bodice to a flat surface and lay it right sides up. now, here is your time to be the designer. you want to choose a place on the neckline where you want your bow to tie. i chose to put mine a few inches off the left shoulder. you can do the same or swap it to the center or right side. there is NO right or wrong here. place 2 pins about 1/2" apart (the black lines below) in the place you choose for your bow. now what we are going to do is to measure our neckline for the bow. i will refer to this as your yellow measurement and your blue measurement to avoid any confusion by using lefts and rights. i know this is all super fancy, but follow me here. :) you will want to pull a measurement on each side from the edge of the back of the bodice, around the neck to the place where you have a pin for the bow. these are shown as the blue and yellow lines above. since these areas have some curve to them, grab a string or piece of elastic (this is my method of choice as i always have bits of elastic laying around - but make sure NOT TO STRETCH as you measure) and measure each side. for purposes of the tutorial, i will tell you my measurements. please don't confuse these with yours! (finished width * 2) + 3/4"
so, for me, since i had a finished width of 1", this was my equation. (1 * 2) + 3/4 = 2.75"
so, i knew that i would be cutting my bow strips with a width of 2.75". hopefully i haven't lost anyone yet. now, you need to determine the length for your strips. i added 20" to my length for each strip to account for the tying of the bow and some "hang down." this is up to you, although i would suggest giving yourself at least 15" of extra for each strip. so, back to my yellow and blue measurements and your second equation. now, we will have seam allowances and such taken off of this, but honestly i didn't think it was enough to worry about since it is a bow and will have some excess. trust me here. do the same math with your measurements and get ready to cut your strips. now, let me write a little "aside" here. i did not cut my strips on the bias. my fabric for the bow was a very thin, lightweight voile that had some drape to it. if you are using a fabric that is a little heavier in weight or doesn't drape well, i would recommend cutting on the bias for the bow strip so that it does lay better around your neck. this is totally up to you. i also used lightweight interfacing the first time i did this only to determine it doesn't need it, so for once...the quicker way won with me! hooray. okay, back to work. grab your yellow measurement strip and fold in half with right sides together. on one end, you will take it over to the machine and stitch at an angle as shown below. once sewn, clip the edge close to the seam to reduce the bulk once we turn it right sides later. alrighty, now, place that strip (still right sides together) on a flat surface and measure from the edge of the angle you just stitched out by the amount of your yellow measurement. since my measurement was 10", i have measured out 10". place a small mark on the wrong side of your fabric on the raw edge where the measurement comes to. now, you are going to sew from that mark you made all the way down the raw edge to the end and finish with an angle just as you did before. make sure to clip the edge along the angle that you sew just as you did with the other end to reduce bulk. once sewn, you want to clip along the line you made that separated the side you stitched from your yellow measurement. clip up to the seam allowance (3/8") and no more. be very careful here. now, take this strip over to your ironing board and pull it right sides out and press. as you can see below (if you aren't completely tripping from the bright ironing board cover that i do love so much but am thinking it was a terrible choice for a PDF pattern designer, haha) the raw edges are exposed along my yellow measurement. take your "yellow side" bow strip over to a flat surface. lay your bodice right sides up. place the raw edge portion (the yellow measurement) of your bow strip along the neckline. you want to place the angled edge about 3/8" from the back of the bodice as shown below so that we can allow for the seam allowance later. pin in place 3/8" from the edge. i do not recommend pinning all the way around before sewing here. this is one of those times that you will need to work your fabric as you sew. i suggest taking your bodice and bow strip over to the machine and easing that bow strip along your neckline as you go. trust me, pinning along the curve might make you lose your sanity. it is much easier to ease as you go. stitch all along the neckline up to the pin you placed on your bodice to mark the bow point. the raw edge should line up with the pin as shown below. take a deep breath, you've got one side done! now, repeat the steps above for the blue measurement. once you have your bow strip for the "blue side" done, do the same with placement on the neckline for it as you did with the other side making sure to leave the 3/8" seam allowance on the back bodice. take it to your machine and work that strip along the neckline. again, the edge of the raw edge should line up with your pin from earlier. take a deep breath and pat yourself on the back. the bow section is done. :) now grab the lining bodice pieces and sew the shoulder seams just as you did above and press out those seam. with the bodice outer lying right sides up on a flat surface, pin down your excess bow fabric as shown so that you don't get it caught in the seams when sewing the lining. place your bodice lining right sides together with the outer bodice and pin together matching shoulder seams just as you do on page 16 of the pattern tutorial. 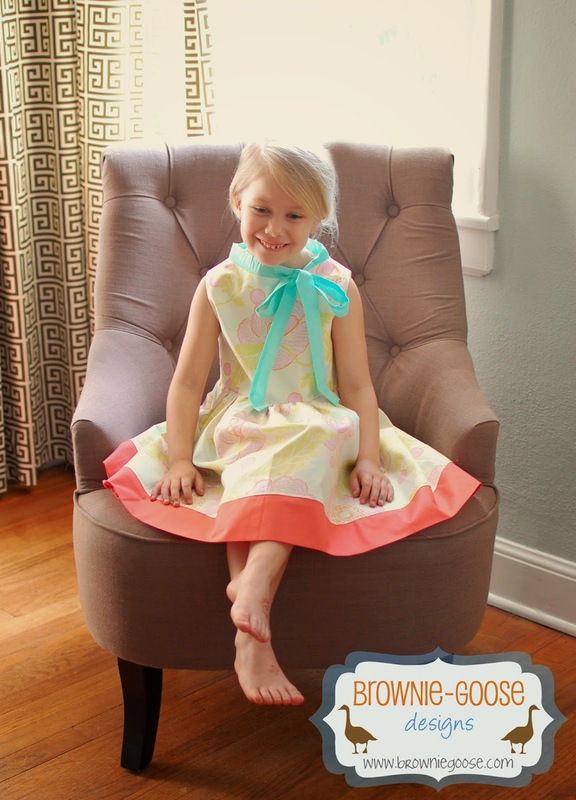 sew along the dotted lines making sure NOT to catch any excess bow fabric in your seams. now, clip the ever-living snot out of your curves as shown on pages 17 and 18 of the pattern tutorial. pull your bodice pieces right sides out from the front just as you do in the pattern and head over to the iron to press that bodice out. oh, and don't forget to swoon when you see that bow neck!!! with right sides together, pinch together your side seams matching the underarm seams for both sides (page 20 of the tutorial for more information). stitch both side seams and take to the iron and press. and guess what ladies...voila! you are done with the bodice portion of your bow neck lazy susan! follow the rest of the pattern tutorial for your skirt pieces and then get ready to fall out of your chairs over the cuteness!! thanks for joining in and i cannot wait to see what you create! 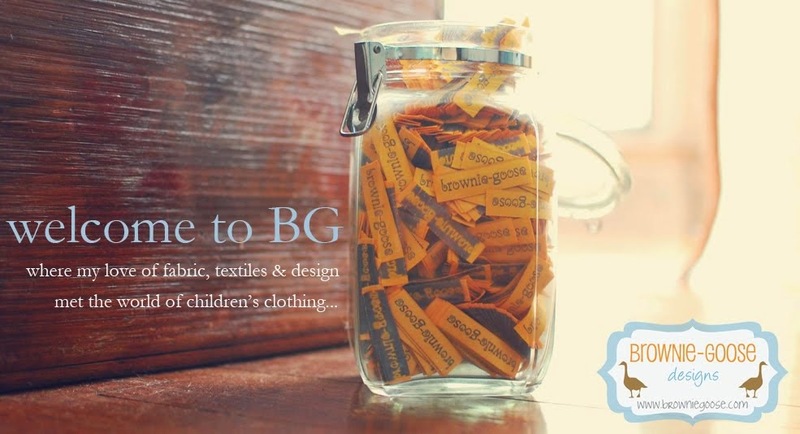 have you joined the brownie goose lovers group on facebook yet? if not, come join the fun and share all of your BG creations!